If you set out to make important positive changes in your life, it will be nearly impossible to achieve them if you enter into this process with a mind full of self-defeating negative thoughts. You cannot put the cart before the horse if you expect to get anywhere. If you jump into taking action steps towards achieving your fitness and health goals without first examining your thoughts, you will likely achieve mediocre results at best…and zero results at worst if your present thoughts are out of alignment with the goals you are trying to reach. In other words, the world we live in demands “doing” and “being” and “getting” and “giving”…and while all those things seem honorable at first glance, when we take this approach we are putting the cart before the horse. Most people are simply not aware that our minds automatically produce negative thoughts because the mind operates from fear…until we have trained it not to. The mind goes straight to the subconscious for answers. This is the mind’s storage files of old thought patterns. These patterns have been operating your mind in a sneaky subconscious way. The mind is always trying to protect us…protect us from failure and from getting hurt. When we begin to entertain some new idea in our minds…like shifting our diets from processed dead foods to “live natural foods” our minds dig deep into their vaults of excuses to present us with why we will ultimately fail at this if we try. That’s because the mind operates from past conditions…from stored files. It knows nothing of the present moment. If you have tried and failed at these things before…guess what? That information is stored in your subconscious and resurfaces whenever you attempt a similar goal. It is our minds we must examine…our thoughts and how they direct our daily activities and our belief systems towards certain things. These are the goal killers…the fear mongers and dictators of our lives…. You must understand before beginning your new adventure that old ingrained patterns of behavior…even though they no longer serve you and are simply part of your old value system…will take time, effort and patience on your part if you hope to make lasting changes. If you are carrying excess weight around on your physical body it is directly linked to the “excess weight” you are carrying around in your thoughts. In other words, it can be tracked back to the nature of the thoughts you hold in your mind rather than the food you are eating. Our reality is shaped by the thoughts we entertain and dwell upon every second of every day. In order to free our bodies, we must change our thoughts…we must align our thoughts and beliefs with our dreams, vision and goals. In order to shift to healthy habits, lose weight or create a well-toned body our thoughts must be aligned with and congruent with that end goal. 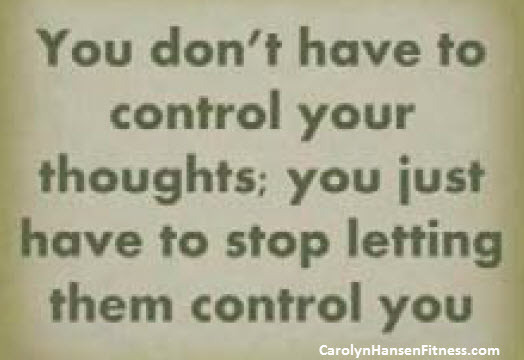 You must rid your mind of these “thought villeins”…they are not now nor will they ever be your friends. And, they are real motivation killers. However, and this is important…this programming can be changed! But these changes must be done consciously by YOU! You must consciously with intent change your previous defeatist negative programming by conscious attention to the moment and what your thoughts are presenting you with. 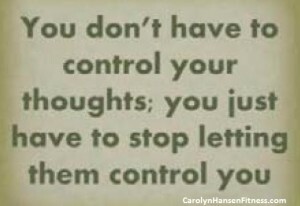 You must shift them out of “negative” mode into positive thoughts and perceptions. If you are serious about achieving a truly healthy lifestyle now, if you’re ready to shift into high gear with your health and fitness visit “Carolyn Hansen Fitness.” All my products support a whole body approach that supports both the body and the mind.